This is the most important man in my life. He cares for me like no one else, he provides for me and our family better than anyone could ever imagine, he loves our family more than anything, he does whatever it takes to make sure we are safe, and he puts our family's wants and needs ahead of everything [well, most everything...I still don't have that $1800 lens I want :-)]. He does all the things I can't stand doing, without complaining...like taking care of the disgusting mouse traps in the winter, he eats my crazy recipe creations without muttering a negative word, takes the kids to movies without me as he knows I can't sit still that long, and has patience when I lose mine. We've been together since we were sophomores in college - 19 years ago! He has looked out for me, helped me in so many ways, been my rock, my soul mate, and my best friend. He has never stopped loving me through all these years. Even now in th midst of my pregnancy highs and woes, he takes extra care to be sensitive to me. He sees a lovely woman carrying his precious child, he sees the good in me I don't see, he sees the beauty in me I am blind to, he sees the love I have even when I may not fully show it. He is everything that I am not. Once in a while I wish I could see myself through his eyes. I love that you can see the reflextion in the glasses. Great shot! So sweet journaling! And love the pic! 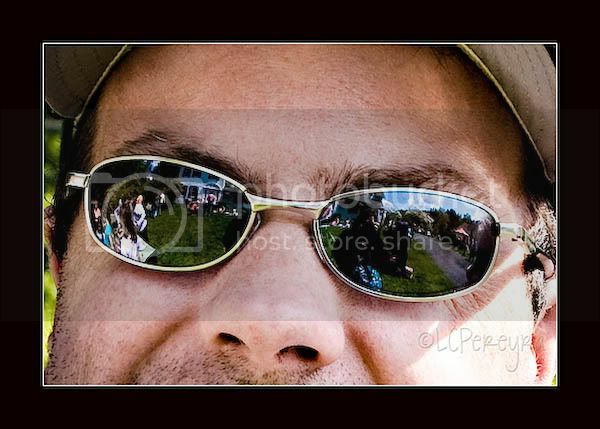 Love the reflection in his glasses!! I love your journaling and your pictures. He sounds like an amazing man! I love the reflection in the sunglasses, and such a sweet sentiment too. Great photo, and I love your journaling! Love that reflection, great shot! your photo is perfect with your journaling. so sweet. love your colors! Love the goggles (what we call them) and your journaling is great. Has he read it yet? Nice image to go along with your journaling--ties in that last thought. Very creative. great reflections! sounds like a great guy! I love the reflexion in the glasses! Nice shot! Very sweet post and a great picture to go along with it! You are very lucky to have him in your life! Fantastic crop and perspective here.